The late 70s and early eighties was the big disco era and many bands established a long-term and successful career. The likes of Kool & The Gang, Shalamar, Tavares, KC & the Sunshine Band all had a run of terrific songs but equally there were many more lesser known acts who had just one or two hits like A Taste Of Honey with Boogie Oogie Oogie and McFadden & Whitehead’s Ain’t No Stoppin’ Us Now then in the eighties there was Rodney Franklin with The Groove, Hi Gloss with You’ll Never Know and this week’s subject, Do It To The Music by Raw Silk. 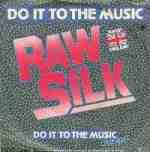 At the time of its released in late 1982, many thought Raw Silk was a group of studio musicians much in the vein of Lipps Inc who charted a couple of years earlier with Funkytown. Not the case, Raw Silk comprised Bert Reid, Ron Dean Miller and three females Tenita Jordan, Jessica Cleaves and Valerie Pettiford. Do It To The Music was co-written by Bert and Ron who also formed the group. He then brought in the girls with Valerie taking the lead vocals. She had been cast in the role of the Dance Captain in the Broadway musical Sophisticated Ladies while Tenita was an understudy to Jennifer Holliday in the show Dreamgirls. Both girls also appeared in the film version of The Wiz. After the hit they made regular appearances at the legendary Studio 54 club in New York and also at a new venue called Broadway 96. They managed one follow up hit, Just in Time which just crept into the top 50 the following year. The same year Jessica left and was replaced by Sybil Thomas but no more hits materialised. Jessica moved to Detroit and continued recording material for Computer Games including R&B Skeletons in the Closet and Dope Dogs. She died in May this year from complications following a stroke, she was 65. Valerie moved into acting and appeared in a number of American soaps including Another World and One Life to Live. She later appeared as Mariah Carey’s mother in the 2001 film Glitter and played Aunt Geneva in Jumping the Broom in 2011. In 2008 she played Sandra Lucas in the comedy series Tyler Perry’s House of Payne and released her own jazz album called Hear My Soul in 2005. Tenita pursued a solo career releasing her debut, self-titled album in 1986 and her first single, I Don’t Wanna Think About It peaked at number 89 on Billboard’s Hot Black Singles chart. She released two further singles, You Got Me Dreamin’ and Free Me which failed to chart and then she disappeared from the music scene altogether. Ron Dean Miller went on to form the short-lived project called Nuance and managed one small UK hit in 1985 with the song Loveride. The lead singer on that track was Vikki Love and a sample of her vocal on this track was used by Nu Shooz on their 1986 hit I Can’t Wait and in M/A/R/R/S’ number one Pump Up the Volume the year after. Bert Reid continued making music and in the mid-nineties he worked with producers ‘Little’ Louie Vega and Trey Max and recorded for independent dance labels like Soundmen on Wax. Additionally, because of sampling, many of Reid’s works, particularly I’ll Do Anything for You, have been re-discovered by R&B and hip-hop artists like Method Man, Faith Evans and Mario and thus continued to make money. However he died in December 2004 in New York after losing his battle to lung cancer at the age of just 48.